New Vision Festival, which is a part of Chopin and Friends Festival present innovative approach towards art. It is the first artistic virtual reality and experimental arts festival organized by NYDAI in New York. Daqi Fang is a Chinese multi-media visual artist, photographer and graduate of MFA Photography, Video and Related Media at School of Visual Arts. His interests lie in the digital era, fantasy for nature environment and human’s interactivity with it, his work has been widely showed in different countries and on numerous publications, now he lives and works in New York. Using satellite imagery, Daqi Fang has created a three-dimensional collaged landscape, offering experiences of a fictional island from different perspectives. 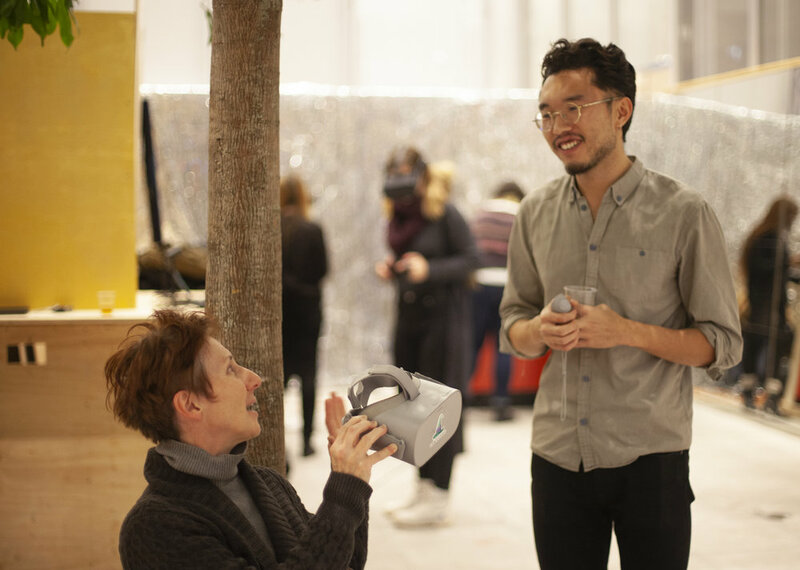 With a video projection, a holographic projection, a virtual reality tour, and a handwritten diary, Daqi explores the boundaries between real and representative nature by creating a specific place and recording his emotional responses to it. DREAM ADOPTION SOCIETY is an artistic collective based in Warsaw, Poland, focused on virtual and augmented reality in the context of theater, performance and contemporary art exploring new technologies to create immersive, performative experiences. 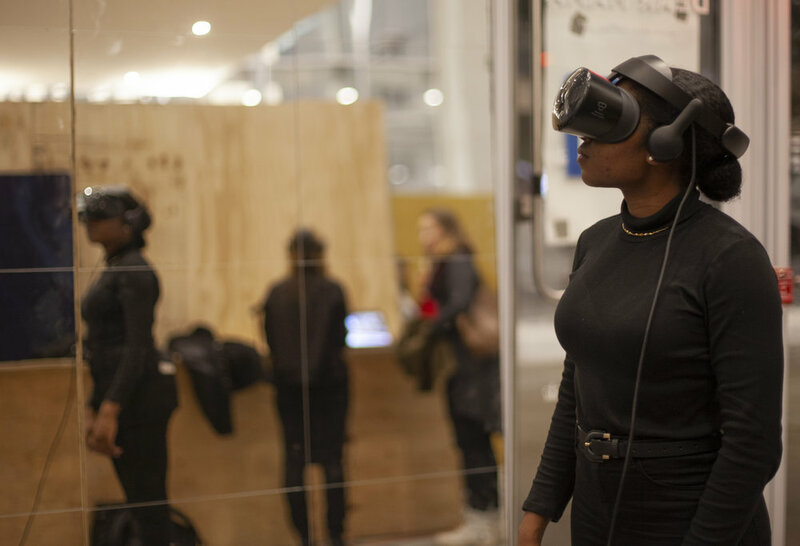 Dream Adoption Society brings the VR installation based on the Raymond Roussel's novel into contemporary focus. In Locus Solus, VR enables a participant to enter a dream world inhabited by numerous cerebral clones and become the narrative agent, setting off explosions or spinning these actions into reverse. Guided by their shepherd, Martial Canterel through narrative and interactive experience our cerebral clone becomes transformed into an eternal life form. Kasia Gumpert (b. Poland) is a New York-based artist and an independent curator. Gumpert graduated with a BFA in Art and Film Studies from Hunter College (2010) in New York and received her MFA in Advanced Photography Studies from the International Center of Photography – Bard College (2014). She works as a Director's Assistant at Postmasters Gallery and Contemporary Posters Gallery. InterFace investigates the medium of photography in the context of contemporary visual culture. Gumpert explores the relationship and its representation through the mass distributed genre of nature photography. She works through composed personal narratives that utilize the connection between photography and collage; mainly interested in creating layered public situations and private moments that generate a new territory from conventional interpretation of reality. Lin Jing is a New York City based artist; lives and works in United States and China. Lin Jing visual inquiry is rooted in human desires, especially our most instinctive and elemental desires. She looks at how the inventions that humans conjure up are based on their desires. In this project, she focuses on exploring a paradoxical relationship between machine and human. She is attempting to find future ways to blur the fixed boundary between human and machine, reality and virtually, and of man and woman by creating a cyborg world – a disembodied world of information and withering of subjectivity. Laka Reacts is an international network (including organizations, companies and individual experts) focused on social impact via design and architecture. Through a comprehensive strategy and with a support of their Partners, they develop projects and programs that underline the crucial role of architecture and technology in the process of social change; they are capable of reacting to unpredictable conditions (environmental, natural, social) and provide safety for its inhabitants. Karolina Majewska is a visual artist working in New York and Warsaw. She has MFAs from the Warsaw Academy of Fine Arts and the School of Visual Art in NYC. 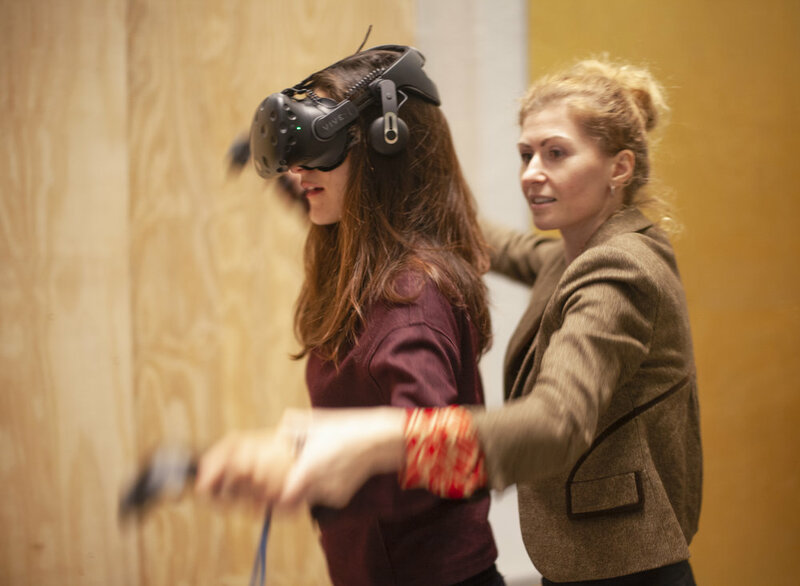 Her recent work has combined VR, spatial painting, and performance. Karolina investigates the varied ways that technology manipulates human perception, as she questions the impact of applied science upon the human capacity for empathy. Her curiosity has been inspired by the transformative and teleportative possibilities of VR/AR and 360-degree cameras, as explored in her present digital project, The Cell. The Cell is an installation, a space, and a three-dimensional painting. The camera is used to stream video via YouTube simultaneous with artist presence inside the room. This provides a mechanism whereby anyone, anywhere in the world - by means of a simple VR headset - can enter the room. You can ‘teleport’ from your space into her space. Meytar Moran is a multidisciplinary artist and the creative director at vrWiz, her recently co-founded Virtual Reality production studio. She is based in New York and graduated from the MFA program in the Photography, Video and Related Media at The School of Visual Arts, NY (May '17). She received a BFA in photography (July, '13) from Bezalel Academy of Arts and Design, Jerusalem. Down The Pixel Hole began as a search for anomalies in the digital matrix of Google Sky and the tracing of conspiracy theories regarding censorship of objects and stars within the sky maps. The project developed into a VR experience, allowing for an immersive journey inside a personal interpretation of the essence of outer-space through the materialization of digital photographic layers from which the Google Sky fabric is constructed. The experience of falling through the envisioned large-scaled empty pixels allows for an exhilarating discovery that is both terrifying and surreal as it is sublime. Alessandro Teoldi is a New York-based artist born in Milan, Italy. His practice encompasses installation, sculpture, photography, and textiles. Teoldi received his MFA from ICP-Bard College, New York and a BA in Photography from Istituto Europeo di Design, Milan. Untitled (American Airlines and British Airways) is a work where Teoldi transforms simple, everyday materials – in this case inflight blankets – into intimate meditations on love and loss, legitimacy and difference, inviting viewers to consider whose bodies matter. He has been collecting traveling blankets for quite a while now, stealing them from his trips or buying them online. Ania and Weronika are architects and best friends, both grew up in Warsaw. Although living in different parts of the globe, separated by 12 hours time difference they remain friends able to merge their NYC-HK realities through a series of pictures taken at the same time. Using nothing more but a smartphone they communicate daily and trade photographs to get a glimpse of each other’s lives. TIME ZONE SNAP is a photography and VR project created by Anna Granacka and Weronika Marciniak. Have you ever wondered what is happening on the other side of the globe in this moment? Would you become a different person if you lived somewhere else? PUSSYKREW are Polish immersive media artists and video directors: Ewelina Aleksandrowicz and Andrzej Wojtas. Creating multimedia installations, audio-visual experiences and sculptures, Pussykrew explores spaces in between digital and physical realms blending fluid identities and futuristic landscapes through experimentation with 3D animation and 3D scanning. Their fascination for virtual environments and physical experiences motivates them to play with deconstructed digital images and cinematic poetry, using the traditional language of painting. By merging with these various planes of reality, they create new forms that are constantly in the process of evolution. the bliss of metamorphing collapse (VR experience, AR App) is the immersive universe of postgender organisms in the process of evolution. Pussykrew is re-imagining the future post-human landscape, new living beings, and their ecosystem. Artists are using real-time graphics and VR sculpting tools, to create new supernatural sceneries, where newly evolved gender-free organisms became the augmented hybrids of a body, technology, nature and the sentient sense of the past. The New York Dance & Arts Innovations is an umbrella organization for innovative artistic activity. We support the production of new art works, encourage experimental creative approaches and provide an international forum for the exchange of creative ideas, resources and products. The organization is committed to art as a testimony to human ingenuity, to its vast importance in communication, education, cultural understanding and international co-operation. We believe that in order to shape the artistic future we need to nurture our artistic present. The core of creativity lies in new ways to perceive and to express, which broaden our understanding of the human condition. It builds on the past and foreshadows the future ensuring the innovative nature of human creativity. We want to present this innovative approach towards art during New Vision Festival which is a part of Chopin and Friends Festival. 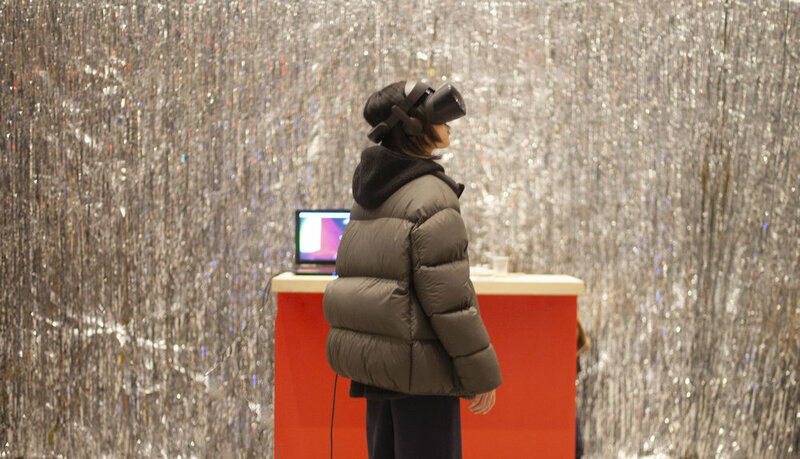 It is the first artistic virtual reality and experimental arts festival organized by NYDAI . New Vision - VR event offers an annual international platform for the presentation, creation and further development of Virtual Reality art. We will showcase creative, unique and inspirational VR experiences that shift or indeed break down the boundaries between, storytelling, documentaries and artistic creativity. The exhibit will present the latest examples of virtual art, and also be entering into the discourse about the creative opportunities. This show will include a group of VR artist selected by a jury of celebrated international artists. This exhibition will provide unparalleled exposure for the VR artists with comprehensive industry attendance and media coverage. New Vision - experimental art - will be raising artistic, psychological, economic and ethical questions during the course of group shows and lectures. NYDAI is dedicated to supporting experimental artists, showing innovative works that apply fresh techniques and aesthetics. The exhibition explores contemporary cultural aesthetics, and presents innovative image making. NYDAI celebrates the achievements of this diverse ensemble of exceptional visionaries.